Already have a Username/Password for Vestnik RUDN. International Relations? Within the body of the text references should be provided in in "Author-date" format - (Lastname F.S., 2009). A complete list of all authors should be presented in every bibliographical entry. Do not shorten titles of your citations. Shortened journal titles should correspond to the MedLine catalogue. If the journal is not indexed by MedLine, please provide its full title. Keywords. Please make sure to add 3 to 10 concise and accurate keywords. The Federal State Autonomous Educational Institution of Higher Education "Peoples’ Friendship University of Russia” (RUDN), represented by the Vice-Rector for Scientific Work Nur Serikovich Kirabaev, acting under a Power of Attorney dated № 44-09/16-144 от 27.07.2016 г., hereinafter referred to as the Publisher, on the one hand, hereby offers to the public at large, hereinafter referred to as the Author, on the other hand, hereinafter collectively referred to as the Parties, to enter into this agreement, hereinafter referred to as the Agreement, regarding publication of scholarly materials, hereinafter referred to as the Article, in the Journal named 'Vestnik of RUDN. International Relations', hereinafter referred to as the Journal, under the following terms. 1.1. Pursuant to Clause 2 of the Article 437 of the Russian Federation Civil Code, this Agreement shall be recognized as the public offer, hereinafter referred to as the Offer. Subject to Article 438 of the Russian Federation Civil Code, this Offer shall be deemed to have been completely and irrevocably accepted after the Author had submitted his/her materials by uploading those onto the network electronic system of the article acquisition for review available at the respective section of the Journal's site at URL: http://journals.rudn.ru/index.php/international-relations/author/submit/1 on the Information and Communication Network known as the Internet, hereinafter referred to as the Internet. The Offer Acceptance means a complete and irrevocable acceptance of the Offer under the terms specified in Clause 3 hereof (the Author accepts the Offer by submitting an application to the Publisher, i.e. 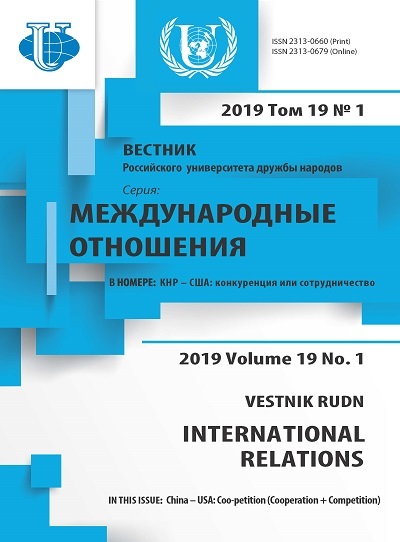 by uploading the Article along with support materials onto the network electronic system of the article acquisition for review available at the respective section of the Journal's site at URL: http://journals.rudn.ru/index.php/international-relations/author/submit/1 on the Internet). The Journal means an academic periodical named 'Vestnik of RUDN. International Relations'. The Application means an electronic request of the Author addressed to the Publisher for publishing the Article in the Journal by uploading the Article and support materials onto the network electronic system of the article acquisition for review available at the relevant section of the Journal's site at URL: http://journals.rudn.ru/index.php/international-relations/author/submit/1 on the Internet). The Offer means this document (offer to the Author) to publish an Article by uploading it onto the site at URL: http://journals.rudn.ru/index.php/international-relations/author/submit/1 on the Internet. The Article Requirements mean requirements to the materials published in the Journal's section named "To Authors" of the Journal's site at URL: http://journals.rudn.ru/index.php/international-relations/about/submissions#authorGuidelines on the Internet. 3.4. This Agreement shall become effective from the time the Article is submitted to the Journal, i.e. uploaded along with support materials onto the network electronic system of the article acquisition for review available at the relevant section of the Journal's site at URL: http://journals.rudn.ru/index.php/international-relations/author/submit/1 on the Internet, hereinafter referred to as the Article Upload. 3.7. The Publisher undertakes, throughout the currency of this Agreement, to provide to the Author the services associated with publication of the Article on the Journal's site at URL: http://journals.rudn.ru/index.php/international-relations on the Internet. 7.2. If the Author disagrees with any modification in the terms of this Agreement, the Author shall have a right to submit a written notice of his/her withdrawal from this Agreement by uploading it onto the network electronic system of the article acquisition for review, available at the relevant section of the Journal's site at URL: http://journals.rudn.ru/index.php/international-relations/author/submit/1 on the Internet.